Hear Sarah Say a Few Words! Photos of Sarah Grace's First Thanksgiving! Photos of Our First Meeting in China!! Photos from Our China Trip!! Pictures of Sarah Since Our Arrival Home! The "Deer in the Headlights" Official Adoption Photo! Two New Pictures Taken in May!! Two More Younger Pictures Below!! Some Pictures of the Orphanage!! How Did We Choose Her American Name? 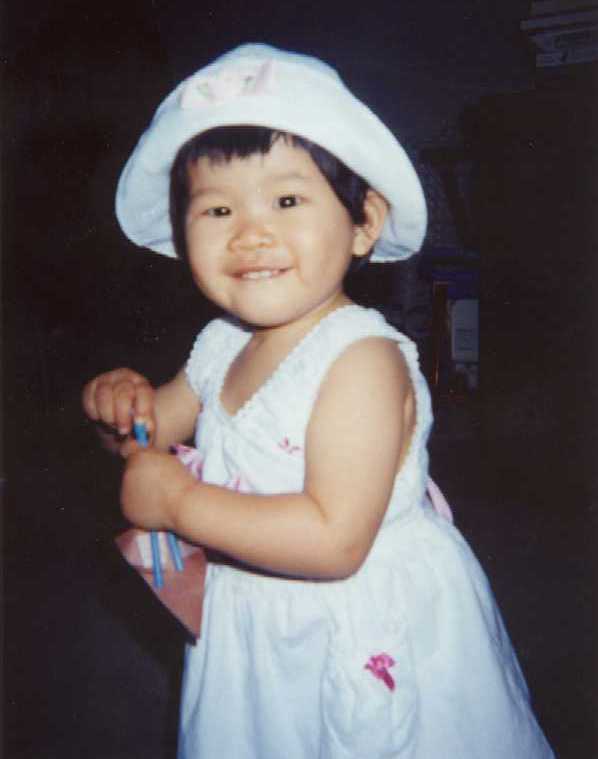 Sarah Grace Dunn, AKA Chang Xiao Chao (Chinese characters above), was born April 10, 2000; we learned on May 24, 2001 that she would be joining us soon. She did join us on July 2 in Changsha, Hunan. 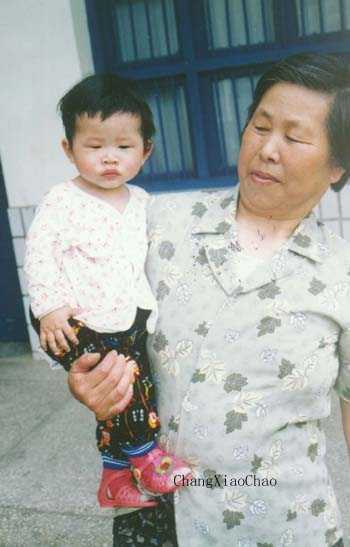 Until she joined us she was at the Changde Social Welfare Institute in Changde, Hunan Province, China. 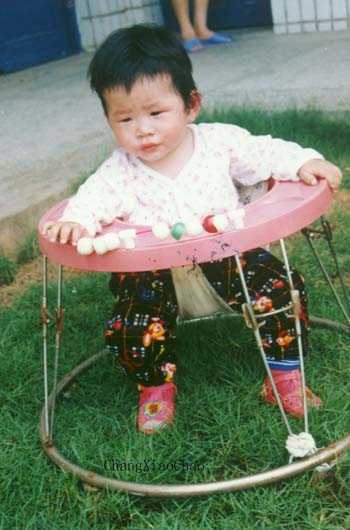 She had been found on May 13, 2000 at the head of Sanlu Bridge in Changde City; someone named Li Jinzhi took her to the local Civil Affairs Bureau who took her to the orphanage. To read an online log, updated en route, of our trip to China to bring Xiao Chao to America, click here. Most of our travel data and post-return pictures are elsewhere on this site; use the links above. What follows are the original notes we put up after we first learned of our match on May 24. Update May 31: We have just received new data taken on May 22, and pictures taken around that time. The referral picture above and the other pictures below were taken in February or before, so these May pictures show a somewhat older Sarah Grace! Other information? Everything else is normal. 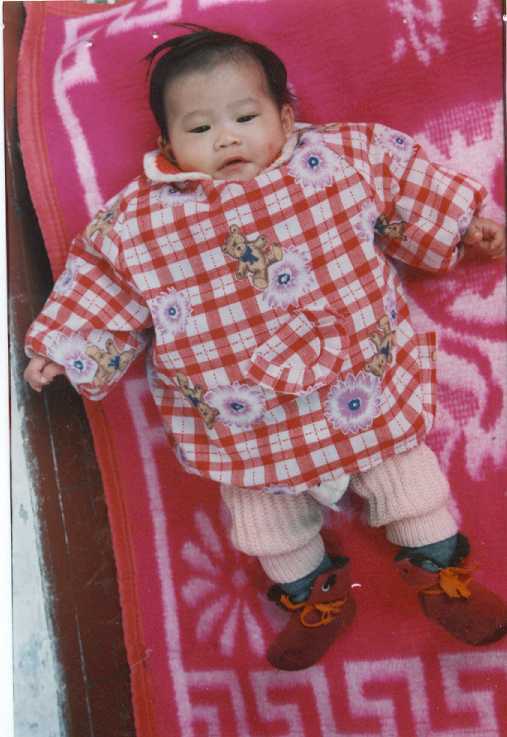 Data from original reports: In February 2001 she weighed 18.7 pounds and was 26.7 inches long. Her name apparently means "Dawn Exceeding". She's described as active; developmentally she is crawling, stands for a moment or so, is talkative and "sometimes obstinate". (Again all these reports apparently describe her as of February.) For more on her as of that time, click here. And to let us know what you think of her, our family and friends can send us an E-mail here. 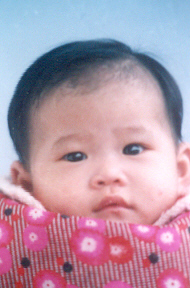 According to the "State of Growth" report on Chang Xiao Chao, here is what she was like in February (for some newer data, see above): Active, Restless, Fond of Listening to Music, Fond of Playing with Toys, Talkative, Energetic, Fairly Extroverted. Here is what she is not: Timid, Shy, Quiet, Fond of Quietness, Fairly introverted, fond of reading picture books (remember this is what she is not :we can fix that, and we will!!!). She "has a strong personality. She is active and energetic and comfortable with strangers." 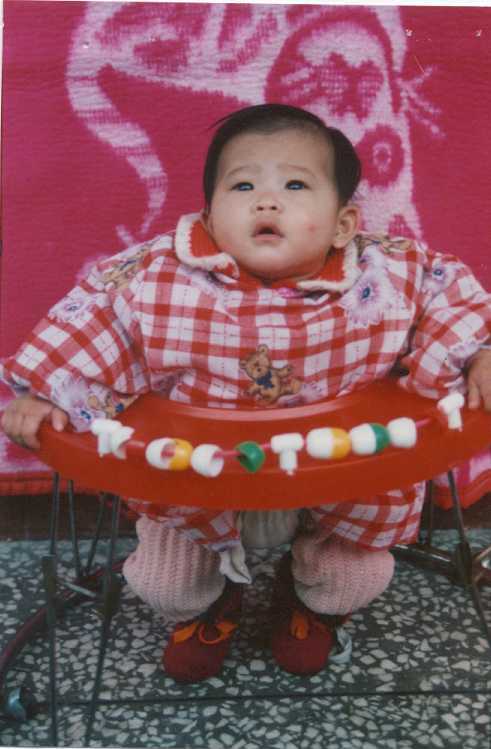 Since she was four months old she has been eating rice cereal (congee) mixed with formula. She has a good appetite and likes noodles. 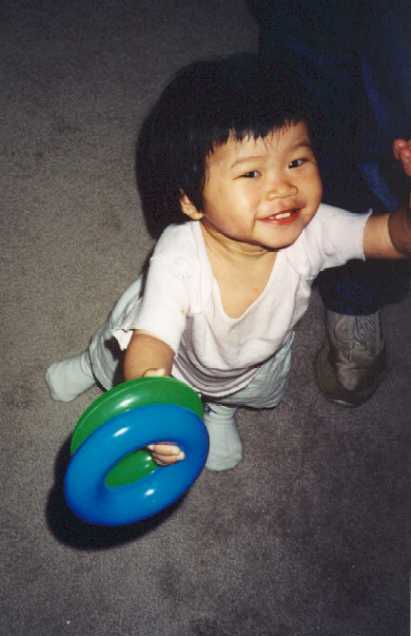 Her favorite activity is her walker and being with the other children; her favorite toys are toys which make noise (!) and stuffed animals. We can't wait to get her and start loving her in person instead of long-distance!